The Russian Defense Ministry has provided evidence of Turkish participation in Daesh illegal oil trade. During the press briefing for the international media, the Russian Defense ministry has provided hard evidence of Turkish participation in ISIL illegal oil trade. The ministry has shown photo and video proof. According to the ministry's statement, the briefing is titled "Russian Federation Armed Forces fighting against international terrorism. New data." The Russian Aerospace Forces commenced precision airstrikes in Syria against Islamic State (IS, or Daesh in the Arab world), a group that is outlawed in Russia and a number of other countries, on September 30, following a request from Syrian President Bashar Assad. Russia has repeatedly called for a broader cooperation in the fight against extremists in Syria, but has not received a constructive reply from its partners, Kremlin spokesman Dmitry Peskov said last week. The Russian Defense ministry will keep updating the evidence. All the materials have been published on the MoD official website. "We presented evidence how the illegal oil trade is carried out to finance the terrorist groups," Antonov said. "We know how much Erdogan's words are worth." “None of Turkey’s top leaders, nor Mr Erdogan in particular, will resign or admit anything, even if their faces were smeared in stolen oil,” Deputy Defense Minister Anatoly Antonov said at the briefing. Erdogan's resignation is not our objective - it is up to the Turkish people, he added. No one in the West had any interest in Erdogan's son being involved in the illegal oil trade, but Russian journalists are brave enough to tell the truth about Turkish crimes. "If they think the evidence is fake, let them make these areas available to journalists," the Deputy Defense Minister said. The size of the illegal oil trade is impressive. More information will be presented next week, Mizintsev said. One of the largest centers of oil extraction is the town of Dier ez-Zor. 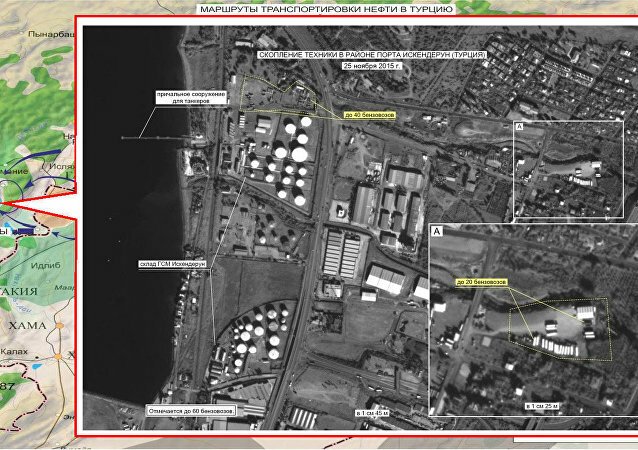 The delivery route runs from Eastern Syria to Turkey, ending up at the Batman refinery in Turkey. Russia is going to continue bombing Daesh oil targets. For the last two months Russian airstrikes have destroyed 32 Daesh oil production facilities, 11 refinaries, Rudskoy said. The general staff has irrefutable evidence on Turkey's involvement in the oil trade. "We have identified three main oil routes," Rudskoy said. "Three main routes have been exposed for the transportation of oil to Turkey under the control of criminal IS groups in the regions of Syria and Iraq,” he said during a briefing. On November 16 260 tankers trucks were spotted near the Turkish border. Some of tanker trucks try to mask themselves as trailers. "Space recoinassance established that after crossing the border tanker trucks moves further into Turkey," Rudsloy said. Then oil was delivered to other countries. Another oil delivery route operates in Northern Syria. To defeat ISIL it is neccessary to destroy the illegal oil trade infrastructure, he said. Main destination for the stolen oil from Syria is Turkey, Antonov said. Today we present only a part of the facts, the Deputy Minister added. Russia is going to present hard evidence of Turkish participation in illegal oil trade. The Russian Defense Ministry going to present evidence of Daesh illegal oil trade. Does Hollande Have the Guts to Join the Russian Coalition in Syria?